One of the great fears historians face around centenaries, such as that of World War I, is that scholarly history will be drowned out by the inevitable frenzy of commemorative films, speeches, parades, websites and popular histories. At this stage of Australia’s Great War centenary years – more than three years into them, with a little over a year to run until the centenary of the Armistice – we might breathe a collective sigh of relief that this has not proven to be the case. To be sure, 2015 in particular saw endless overblown rhetoric about Gallipoli and the Anzacs, and there have been plenty of instances of dissident voices being shouted down, most notably in the case of Yassmin Abdel-Magied, after her relatively inoffensive post suggesting that the Anzacs were not the only war victims worth remembering. But major museum exhibitions have generally been nuanced, while a series of popular documentaries and mini-series asked Australians to take a considered look at their past rather than simply mythologising it. Historians have been closely involved as consultants, curators, speakers and, not least, as academic historians producing research that has offered counter-narratives, complicating questions, and new perspectives. If Joan Beaumont’s magisterial Broken Nation and the series produced by both Oxford University Press and Cambridge University Press have been the most obvious examples, and the highlights in terms of prestige and coverage, they have nonetheless been buttressed and augmented by an array of other monographs, journal articles and edited collections which show that, despite the rivers of ink already expended on Australia’s experience of World War I, there is much more left to say. 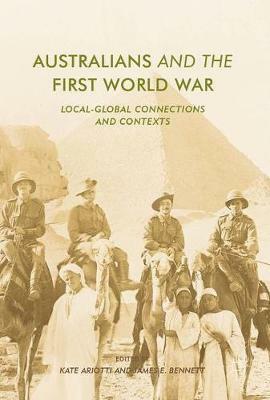 Australians and the First World War, like all the best edited collections, is organised by concentration on a common theme across disparate topics. The authors and editors all seek to revisit one of the most profound moments for the Australian nation by shifting from a nationalistic viewpoint to a more transnational and globalist one, exploring the Australian experience by either comparing it with other nations, or by examining the international connections and experiences facilitated by the war. Much as this might appear to be common sense, it represents a departure from much of the insular, nationalistic historical writing and popular memory that has examined Australia’s World War I as if the nation was an island unto itself. The contributions are original, and at times surprising. Kate Ariotti, for example, shows how the experience of becoming a prisoner of war of the Ottomans – a fate which befell nearly 200 Australians – exposed the POWs to the strange and ‘oriental’ customs of the Turks, but also to those of fellow captives from a range of national armies. Such encounters with foreign peoples were often difficult. Victoria Haskins explores the trials of some Australian nurses suspected of improper relations with Indians, Karen Agutter shows that foreign-born soldiers often had a difficult time of it in the AIF, and Samuel Furphy shows that, even in the armed forces, Aboriginal people continued to face discrimination, both during and after the war. The attitudes and mindsets of White Australia persevered into and beyond wartime. Other chapters explore the way global events played out in Australia in terms of the growing dimension of the ‘Irish problem’ after the Easter Uprising of 1916, the difficulties of maintaining an emotional commitment to the war, and changing patterns of commemoration and memory-making. This is a wide-ranging collection that embraces frontline service, cross-cultural encounters, home front tensions, volunteer mobilisation, and past and present commemorations. Much as the collection is a worthy addition to the stock of historical writing about Australia and the Great War, it suffers from its very breadth. Some authors appear to have found it difficult to write within the book’s overall theme and are thus poorly integrated, while the range of topics is arguably too broad. Transnational perspectives, cross-cultural encounters and global contexts would each have provided a sufficient theme; attempting all three in one volume is perhaps too ambitious. Nonetheless, the book shows that Australian war history has much more to offer – and illustrates possible future directions. * Martin Crotty is an Associate Professor in Australian History at the University of Queensland. He has written for Honest History on Anzac fun runs and the consumption of the past.